Today, Mohammad Morsy should be officially declared President of Egypt. Tens of thousands of supporters are being assembled on Tahrir Square in Kairo where Morsy is expected to deliver a speech prior to his inauguration as a president of his country. The elected president of Egypt, Mohammad Morsy, [feels honoured] to swear the presidential oath today before the Supreme Constitutional Court and deliver a speech at the University of Kairo. Above: Israel's president Shimon Peres in an interview with CNN on June 12 where he praised the Arab Spring after having noted that he never had any problems with Egypt's former president Mubarak. ... who vigorously and up to the last moments were taking bets for the favorized and [intensely considered] victory of the candidate [representing] the faction of Ahmad Shafiq with a modest [lead of votes]. The elected Egyptian president: Men of the press and [other] media [are] most benevolent or of much comprehension [i.e. to the cause of the revolution]. 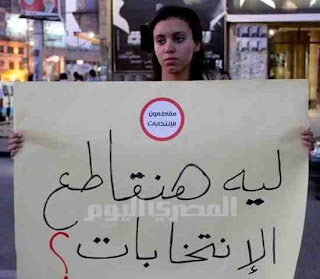 The elected Egyptian president: There is no place for the language of [treason] in all aspects of action. Morsy calls for a large united conference that represents all [different opinions] in all fields [i.e. of society]. Morsy calls for a united conference [of consultations] to reject the commands that are turning into "right behaviour" what is [already] accepted by everybody. Numerous Egyptian parties announced the formation of a civil political current under the name of "Third Current". 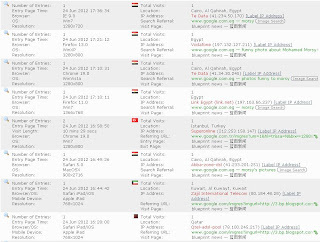 Distribution of localized visitors to "blueprint news"
The above screenshot is showing the centers of campaign for Ahmad Shafiq (left) and Mohammad Morsy (right). At the presentation of the overall result, one could see Morsy supporters getting up from their seats, their arms being raised in joy while Shafiq supporters remained stunned. Scene from Tahrir Square in Central Kairo after the announcement of Morsy's victory (above). However, the demonstrations are not only in support of Morsy alone but as well directed against increasing influence of the Military Committee that recently reduced the president's rights and dissolved parliament. All the people want to achieve is to get rid of the old system presented by former president Mubarak and his comrades-in-arms of the Military Committee. President Mohammad Morsy is governing Egypt with insufficient authorities. 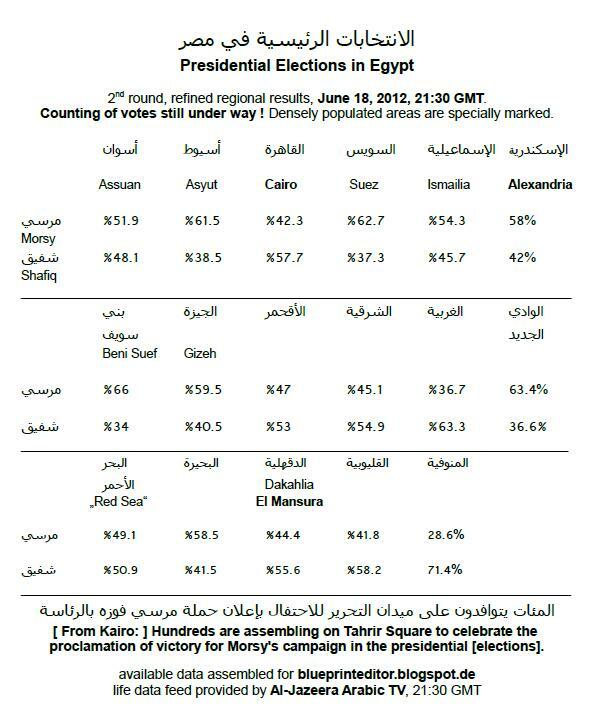 Participants in the Presidential Elections of Egypt. Winner is still the Military. 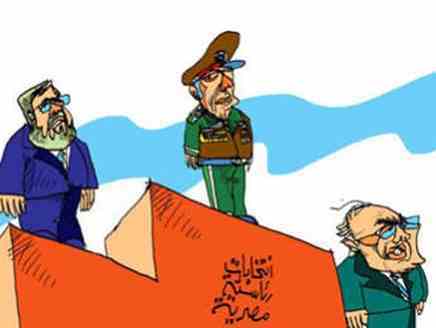 The above cartoon has been published on Al-Arabiya's website on the same day. 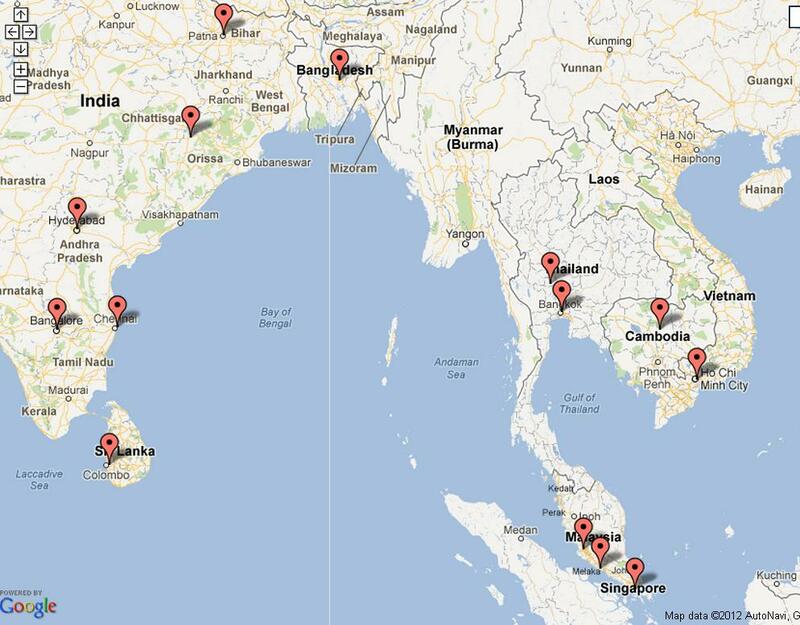 TV screenshots for this site have been taken from life coverage by Al-Jazeera, Arabic channel. and we don't recognize the coming president. Some complaining activists favouring a boycott of the presidential elections are saying they won't accept the coming president because he will not be legitimate. Protest [arising] from campaigners [favouring] a boycott of the elections. Visitor Statistics for "blueprint news"
Morsy engages in the selection of a prime minister and vice-prime ministers [coming from the] outside of [his] Party for Liberty and Justice. The military council: The authority of law is a base of the nation's power. The military council of Egypt confirms its stopping of any [one-sided] race [on behalf] of any political powers [whatsoever]. Juridical sources in Egypt [told] Al-Jazeera: For tomorrow there is a [high] probability for the result of the presidential elections being proclaimed. 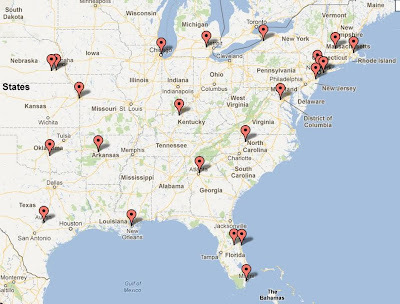 One identified visitor from Washington D.C. to my blog. According to his equipment he should be a professional. Yesterday, June 19, Shenzhou 9 spacecraft performed a fully automated docking manoeuvre to Tiangong space station. 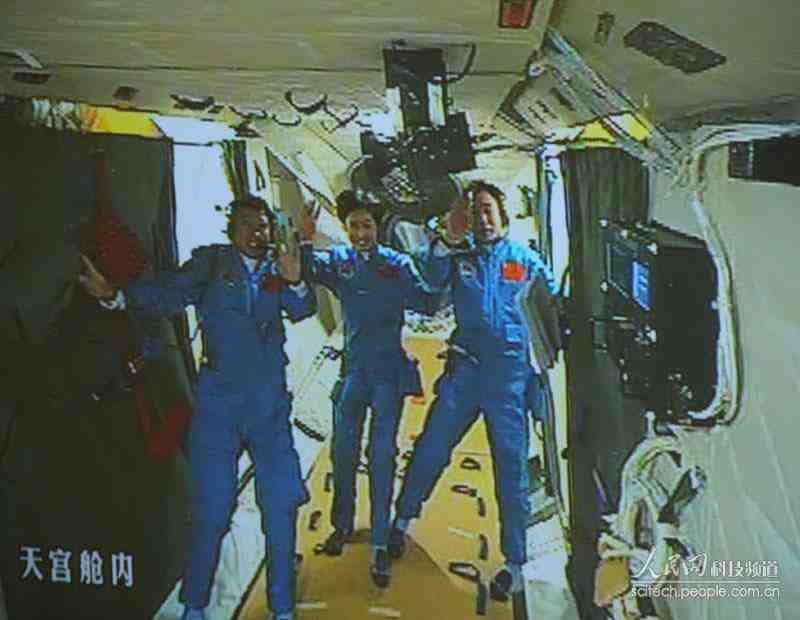 Here are some quotations from the official website on China's space flight. China's astronauts arranged quarters for the first time in the Palace of Heaven - " It's more than just opening the door to Tiangong "
They did not just open the door to Tiangong, but even more manned a new domain for experiments and a new starting point [in the frame of that] spaceflight project. Chinese comment: "That is what Yang Li Wei proudly told his comrades-in-arms." 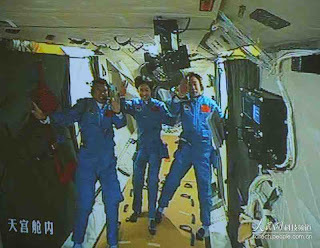 Background: Yang is another astronaut who earlier experienced space on board of Shenzhou 5. By the way, the Chinese website on "opening the door to the Palace of Heaven" turned out to be infected with a trojan which is rather unusual for such kind of official information sites. The only other exception of that rule I found was the website of China Daily. As I consider the English website of China Daily to be less useful than Chinese language sites, this was no real problem for me but might be annoying other foreign visitors who make up their target group. 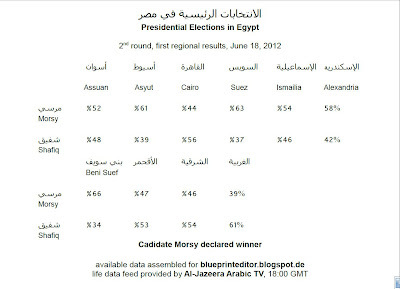 It is still uncertain whether Morsy can be expected to be the winning candidate in the presidential race or not. 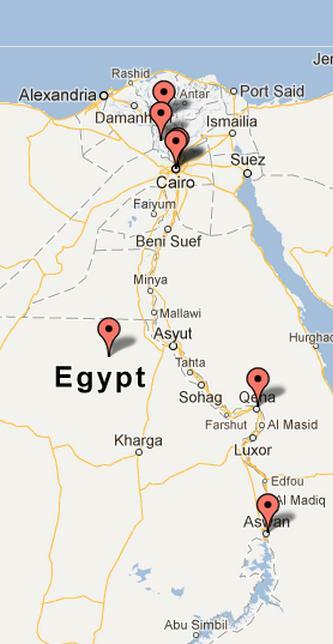 In fact, it seems that Egypt is extremely polarized on this matter. 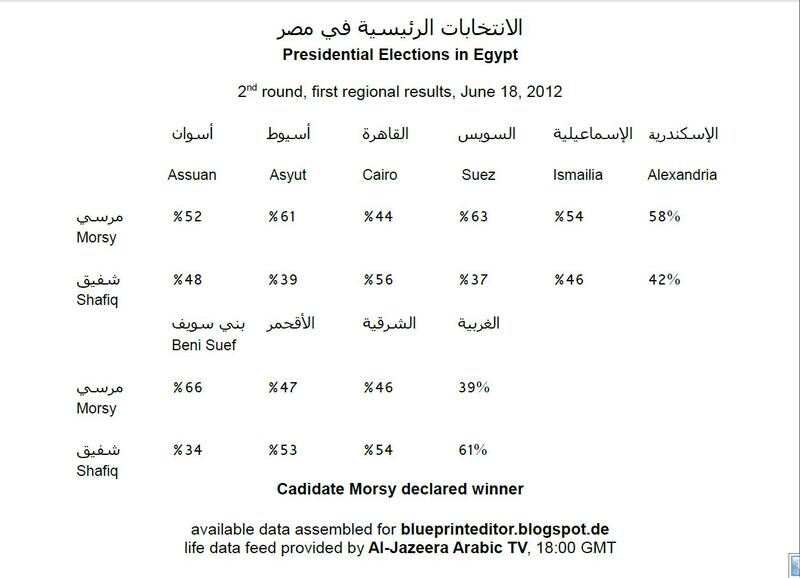 Even Egypt's press is split on the outcome of the presidential elections [=> BBC]. While some regions are showing a strong preference for the candidate of Egypt's Muslim Brotherhood, others prefer that kind of "peace and stability" which only a former representative of the Mubarak era could offer with some credibility. 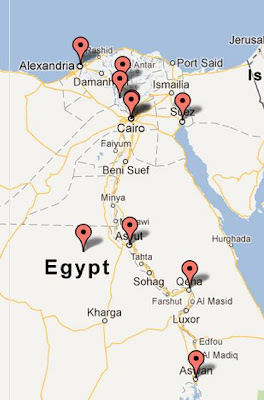 However, the presidential race will be decided in the densely populated regions rather than some "peaceful and secure" holiday resorts for wealthy tourists or residential areas for the rich and influential of Egypt.
" ... 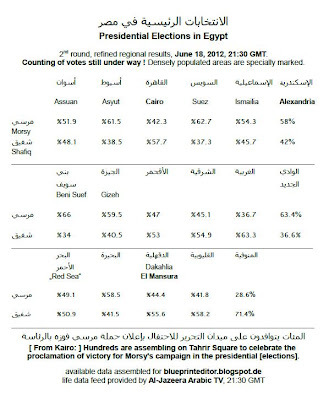 According to results made public by the Muslim Brotherhood, from just over 80 percent of the more than 13,000 polling stations nationwide, gave Morsi 52.5 percent of the vote and Shafiq 47.5 percent. The figures were from results announced by election officials at individual counting centers, where each campaign has representatives who compile the numbers and make them public before the formal declaration. 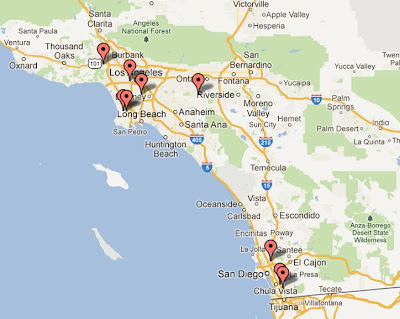 The early, partial counts proved generally accurate in the first round of the election last month. " 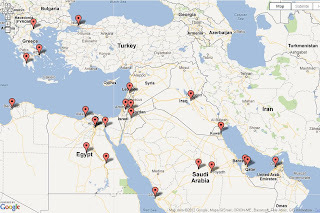 Identified locations for the last 32 visitors to blueprint news coming from Egypt (below). 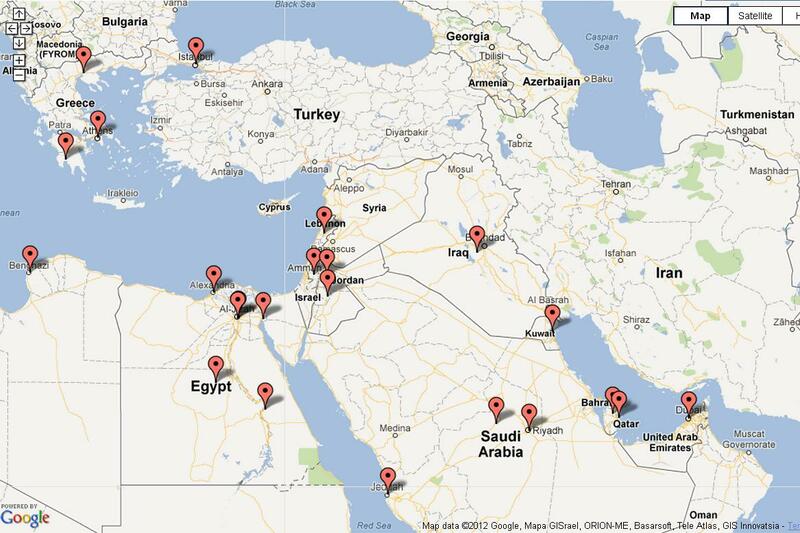 The map of Egypt might serve as well to locate most places from where regional election data are already available. Picture taken from the Chinese daily MORNING EXPRESS 近日早报 on June 16, 2012. 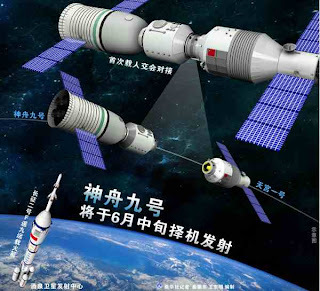 Today, at 18:37 Peking time (10:37 GMT) a Long March II-F rocket should have been launched, carrying the Shenzhou 9 spaceship with three Chinese astronauts on board. 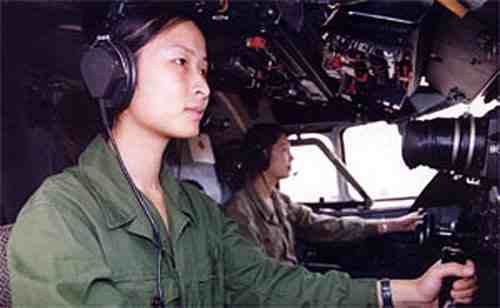 For the first time, a woman astronaut has been selected for China's space mission: Liu Yang, born in October 1978 in Henan province, is accompanied by two male astronauts from Shanxi province: Jing Hai Peng (* October 1966) and Liu Wang (* March 1969). 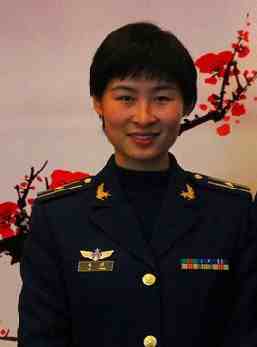 Jing Hai Peng has already been in space with spacecraft Shenzhou 7 in September 2008. After docking with the 335 km-high Tiangong space station, the crew will spend over a week living and working there, testing new systems and conducting a number of scientific experiments. Press conference in the campaign of Mohammed Morsy, candidate in the presidential elections of Egypt. Morsy [said]: "The revolution that ousted Mubarak did not [yet] finish with the [state] and we are [still] able to resist." Morsy: "Here [are] those who are trying to [continue] and are attending to organize the misfortune of the Egyptian people. And [those who] wish [such] mocking out of their [own] decision." Morsy: "Should we celebrate the right of being witness to those who killed you and whom we witnessed presenting [in public] themselves and that irrevocable order." Morsy: "Constantly in my electioneering campaign we were able to define the goals of our revolution." Morsy warns that a new revolution [starting] from here would trigger off a distorted manifestation of the Egyptian people's [real] will. 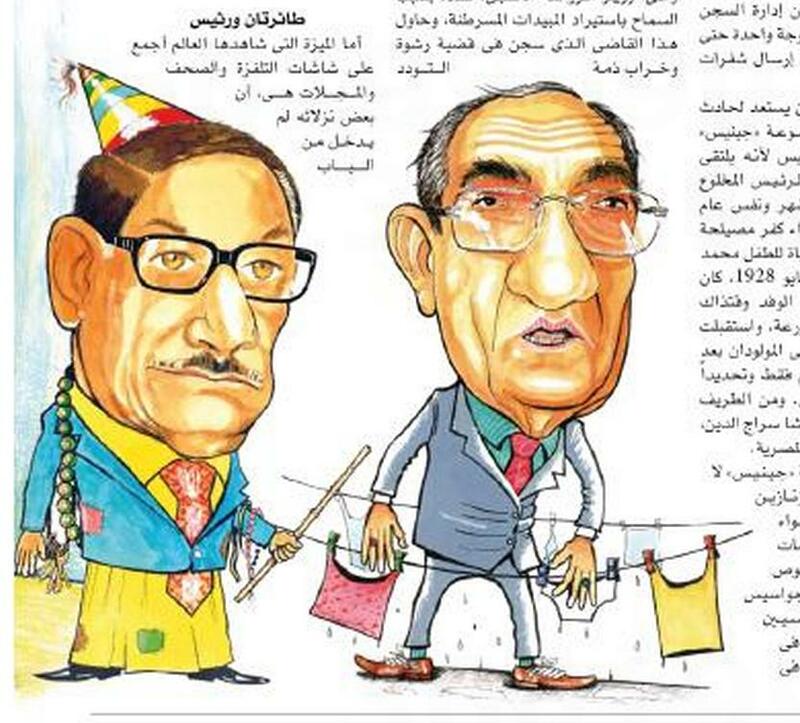 Al-Ahram cartoon showing both opposing candidates in the presidential elections of Egypt: Morsy (left) and Shafiq (right). 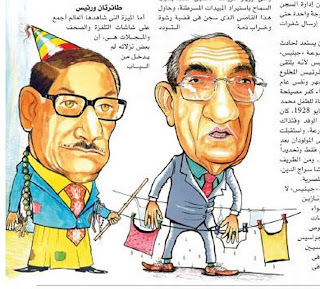 By the way, Mubarak's former prime minister Shafiq is known for his support of women's rights while Morsy has been characterized by some old-fashioned outfit which might hint at his conservative Muslimic attitude. The presentation of Mohammed Morsy in the above cartoon reminds me of a funny story from my old book of Arabic lessons. It's about a person with a similar (traditional) outfit and who is named Djukhan. That guy who I understand is some kind of Arabic punch finds it difficult to be accepted by his neighbours as there is always somebody pointing at him and critisizing what he is doing. That story is showing how difficult it can be to satisfy all of your neighbours who are pestering with all of their lousy comments. Maybe, the West and Israel are having problems with Mohammed Morsy because he is representing such kind of person, rooted in the culture of his region rather than being a sneak opportunist ready for any deal whatsoever. 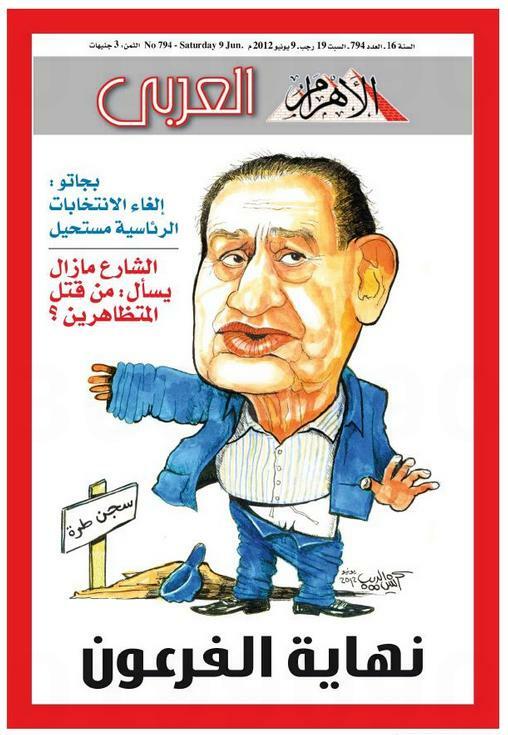 Mubarak - "The End of the Pharao". 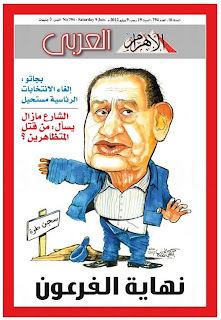 Title of Al-Ahram on June 9, 2012. Egyptians are voting in a two-day run-off election to choose their first freely elected president. The build-up to this weekend's run-off has been marred by a Supreme Constitutional Court decision that parliament had to be dissolved. On Thursday, a panel of judges - appointed by Mr Mubarak - ruled that the law governing Egypt's first democratic elections in more than six decades was unconstitutional because party members were allowed to contest seats in the lower house reserved for independents. Mr Mursi's Freedom and Justice Party (FJP) won about 100 of its 235 seats in the People's Assembly by running candidates for individual seats. The ultraconservative Salafist Nour party also enjoyed similar success in seats designated for independents. If parliament is dissolved swiftly by the ruling Supreme Council of the Armed Forces (Scaf), whoever wins this weekend's presidential run-off could take office without the oversight of a sitting parliament, and without a permanent constitution to define his powers or duties. Islamist, liberals and scholars denounced the ruling as a "coup", saying they feared the ruling generals would take back legislative power. Meanwhile, the Nobel laureate and former head of the UN's nuclear watchdog, Mohamed ElBaradei, warned that Egypt was suffering under worse conditions now than under Mr Mubarak. Egyptian dream of democracy fading, as presidential runoff sees a disillusioned electorate forced to choose between 'Islamic rule' or 'the old regime'. Today, June 12, the speaker of China's ministry of foreign affairs, Liu Weimin, presided over another regular meeting of journalists. Among other subjects, this meeting was dealing with China's official position in the question of U.S. economic sanctions on Iran. On the same day, CNN had already reported that some countries should be excluded from a U.S. "blacklist" of countries after having reduced their oil imports from Iran. 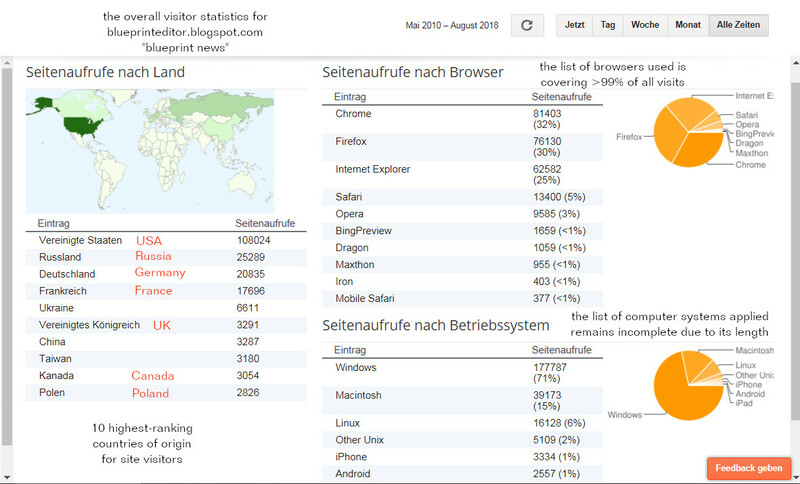 CNN mentioned that only China would practically remain on that list. 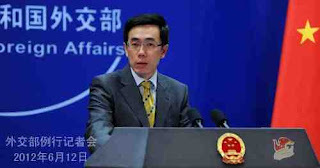 Foreign affairs ministry: The import of crude oil from Iran is altogether, both, legitimate and reasonable. - Unilateral sanctions [will be] opposed. 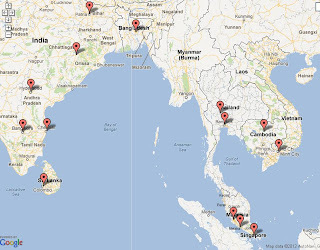 According to reports dealing with a U.S. declaration that their "law which has been authorized [on behalf of] national defence in the fiscal year of 2012" and which is related to the clause of sanctions against Iran should not be applicable against the economies of India, South Africa, South Korea and Taiwan: The U.S. side already and all-sidedly announced the range of sanctions against and urging of the Chinese side, while both sides are still engaged in a dialogue on the subject of those sanctions. Is there any [reaction / reply] from the Chinese side to this subject ? Are there reductions in the import of Iranian crude oil or not ? Are the Chinese and American side continuing their talks or not ? The Chinese side is persistently opposing one country's implementation of unilateral sanctions against another country on the basis of that [acting] country's internal laws. Furthermore, [China] doesn't accept any enforcement of their unilateral sanctions [directed at] the practice of third countries. China needs to proceed [on the basis of] its own economic development, importing crude oil from Iran by using regular channels [of trade], making it public and transparent, without violating the United Nations Security Council's resolutions, without harming the interest of third countries and the international community, altogether, both, legitimate and reasonable. 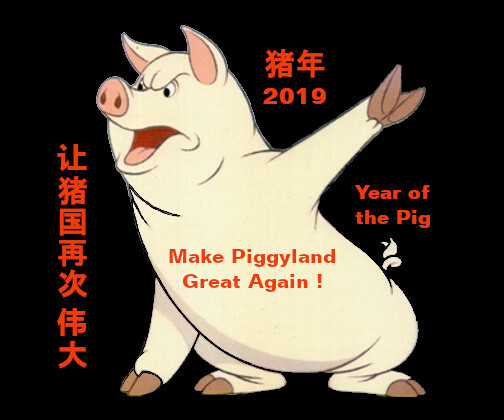 The Chinese side has already made itself clear to the U.S. as to the above-mentioned standpoint. Such declaration from Beijing is most drastically opposing the statements that Israel's president Shimon Peres made in an interview with Christiane Amanpour in her show on CNN tonight. Not only does he feel "in perfect agreement" with President Obama when it comes to economic sanctions on Iran. Furthermore, he says that military action "should be in Iranian minds". Only two days ago, Kofi Anan mentioned a third party that should be involved in the Syrian conflict when he was speaking in front of the United Nations General Assembly. 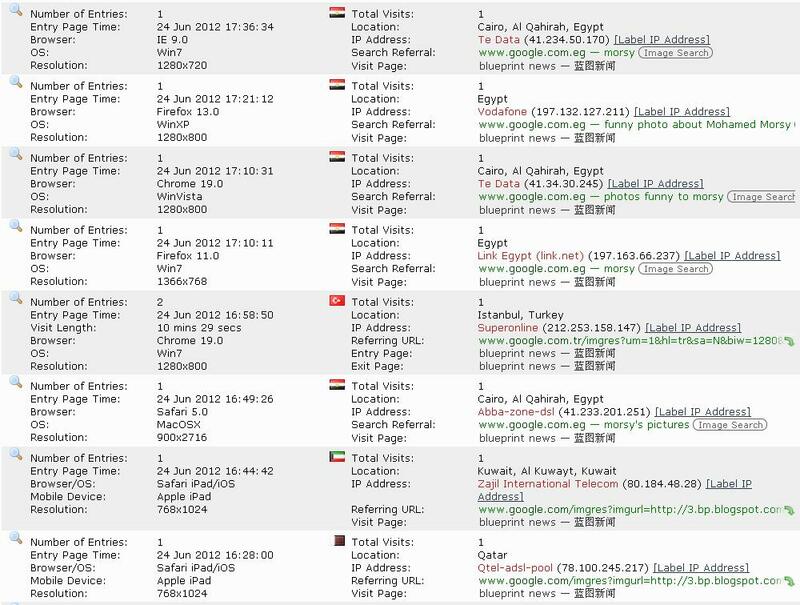 Today, on June 9, People's Network, Beijing, had the story of "terrorists" acting in Syria on behalf of the U.S.. As this is really hard stuff on a subject I just dealt with in my last blogspot, I decided to enter that information into my blog. 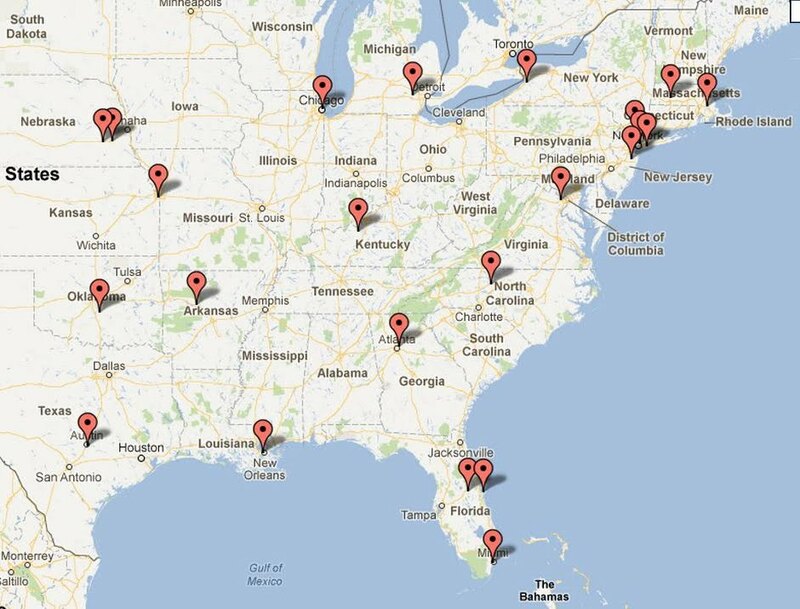 Believe it or not - I think the information can be checked by people more powerful than me. Who fabricated the latest incident of a massacre ? Hinting at four related cases of slaughtering in Syria, the Turkish admiral [Turkur], and who just resigned from Turkey's war academy, considered on June 7 that terrorists, accepting U.S. support and assistance, in recent weeks staged terrorist attacks that were aimed at Syrian citizens and security units. Admiral [Turkur] pointed out that such terrorist activity is only trying to interfere with an imperialistic military tactic [applied as a consequence of] Syria's internal politics.
" Bringing change by indirect response to the expected dropping of oil prices - Four important reasons "
Affinity between "Patriotic Syria" and Moscow on the subject of Iran's role [in the conflict]. [Russia's foreign secretary] Lavrov is calling for a collaboration of Tehran in an international conference on Syria ... while the opposition is on its guard. 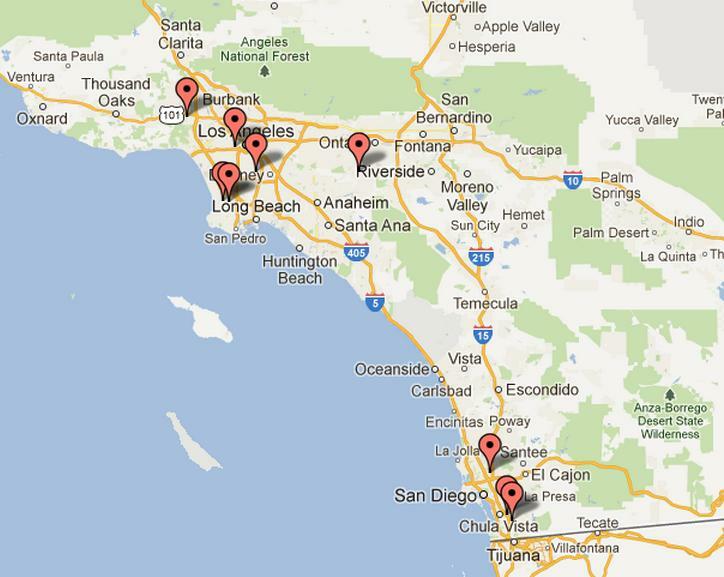 For additional information on Syria, refer as well to my last blogspot ! 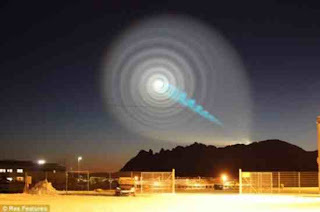 Manifold foreign media reported at local time on the evening of June 7 the appearance of a mysterious light beam, [resembling] a travelling whirl, in the sky over Israel, Syria and some other Middle Eastern countries. Numerous eyewitnesses considered having seen an UFO. 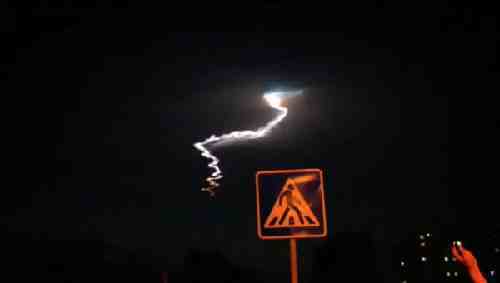 However, afterwards the media had to inform that [the observed] strange light beam probably came from the test of a Russian intercontinental ballistic missile. When I found this article, I was originally looking for some news on an alleged meeting between Russia and China that should now take place in Beijing and be dealing with the Syrian subject. Such information had been announced by CNN some hours before. Unfortunately, I didn't find any further news on that meeting in the semi-official Chinese source. Today, Kofi Anan, special envoy of the United Nations for Syria, delivered his report to the General Assembly on latest developments of his mission. Anan told the assembly of another massacre that left children and their mothers dead in a Syrian village just the day before. He stressed that even though his six-point plan has not been realized up to now, it would be a mistake to resort to [military] interference as there seems to be a third party involved in the conflict. In another speech, held some minutes earlier, the Secretary General of the Arab League, Nabil al-Arabi, had already pointed out that Syria was on the brink of a civil war while UN Secretary General Ban Ki Moon had stated before that the Syrian leadership lost its legitimacy when it refused to implement Kofi Anan's propositions in order to end the conflict. Kofi Anan: About three months [ago] began my difficult mission in Syria on behalf of the United Nations and the community of Arab nations. I regret to inform you that my plan has not been applied in Syria. Many nations, represented in the United Nations General Assembly, are disturbed by the actual extent of violence in Syria. However, a change of politics will be difficult to achieve as Russia and China are still decided to block any further pressure on the Assad regime in Damascus. Furthermore, Venezuela recently joined Iran as Syria's principal ally after having passed a solidarity agreement that is considering U.S. influence as an "imperial threat" to Syria. Therefore, those who are suffering from shelling by Syrian military units and unrestrained killings by pro-Assad militias should not be too hopeful. The Chinese delegate's response after the speech of Kofi Anan, at least, is showing some pity for the victims of violence. However, it is still not clear whether this would lead to a real change of the Chinese position in the United Nations Security Council. 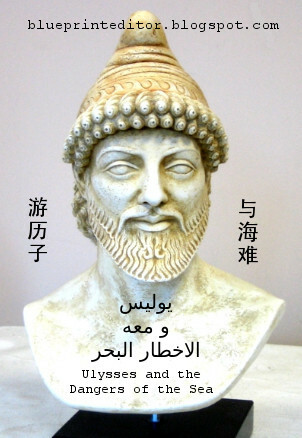 China's delegate: [We] are wishing for the [regions] of fighting in Syria that support would arrive for the plan of [Kofi] Anan and that acts of violence would stop.